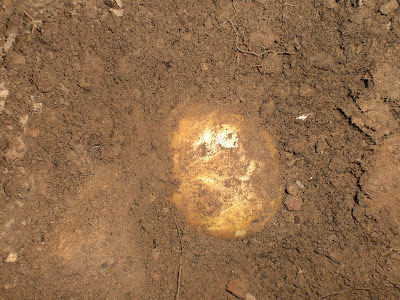 gardening in the boroughs of nyc: Digging Up the Potatoes! I decided to dig up most of the potato plants because they were looking pretty sad. I try to be very careful not to puncture the potatoes with the hand trowel. Amateur that I am, I pierced through some spuds the last time I dug up some plants. I had envisioned that we would get 5-6 potatoes per plant, but that is not to be. 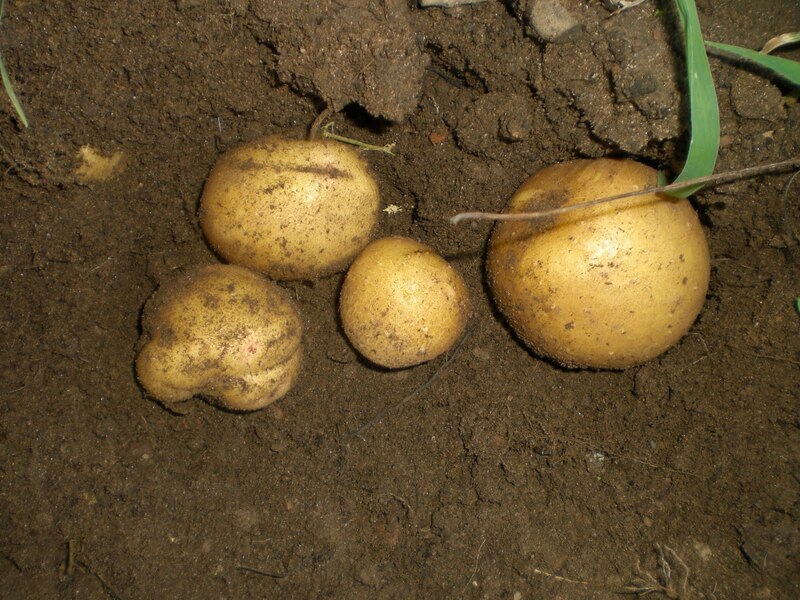 If we were lucky, we got 4 potatoes on a plant. However, most, we only got 2. I think our soil needs better nutrients next year. So here's our harvest. I don't have a scale to weigh this, but I'm guessing it's a good 1.5 pounds of potatoes. Most were medium to small potatoes, but we did get 2 large ones. I can't wait to make mashed potatoes with these Yukon golds! How fun! I've never grown potatoes before. Do they need certain requirements? I'm curious to know if you taste a difference between these and the ones you buy at the store. Enough for dinner at least! I grow them in straw cages, but this year had a very disappointing year, too. They're going to taste great! They look good. I am not sure how many I get per plant- 3-5 if I had to guess. It's been a bad year for my potatoes, too. They like cool, wet weather, which we haven't had up in the north east this year. Still- those look lovely and I bet they will taste divine! The potatoes look very good. Our potato harvests seem to be pretty variable but probably average only 3-4 potatoes per plant. It's not uncommon to only get two. I think the most we've gotten were 5 medium sized potatoes from one plant. Congrats on the harvest. Mine are still looking pretty good so I'm waiting to try to harvest them from the buckets they're growing in. Maybe you didn't get as many as you wanted, but what you did harvest still looks great! Are these from seed potatoes, or supermarket potatoes? Enjoy your mashed potatoes! Those potatoes look good, I'm trying very hard not to dig up my Yukon Gold, I want to wait until the leaves die back and see how many pounds of potatoes I get from 1 lb of seeds. Freshly dug garden potatoes are really wonderful eating. Enjoy the fruits of your labors. They look very tasty! They look great! They remind me that we need to dig ours up. I've had them come back the next year even though I was sure we had dug all of them up. The homegrown ones definitely have a better flavor than the store bought. Looks like a good harvest to me. How'd you like to nurse plants along for months and get a few marbles for all your troubles? You did good. We have been enjoying garden potatos for about a week now and they are just wonderful. Your potatos look fantastic enjoy!!! Your potatoes look great! I am so anxious to harvest mine soon! The plants are almost completely dead, so it will be soon!! I am using the "potato box" method! 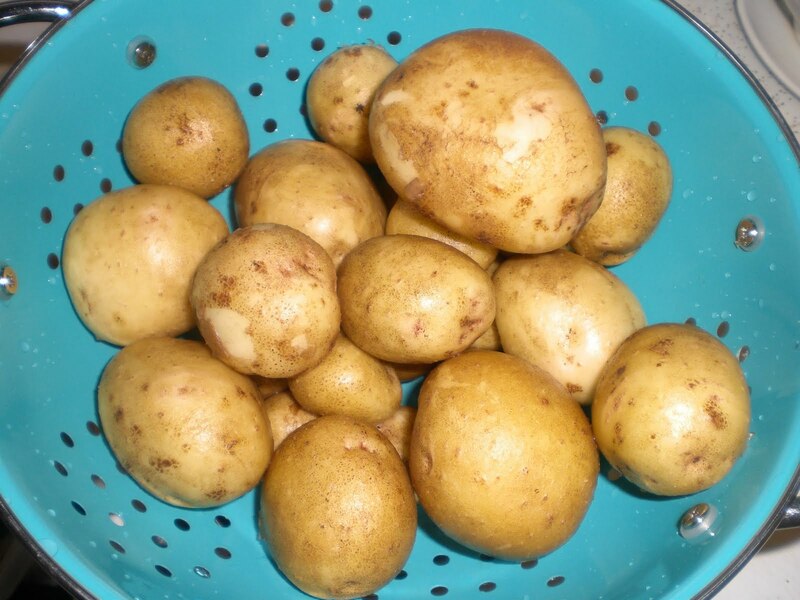 I got 4 or 5 small to medium potatoes from the early variety I planted in my home garden. The ones across the street, which don't get as much sun, are starting to die back. I was disappointed to see only 1 or 2 small ones under the ones that had already died. I'm wondering if the other plants will have more. I think all the rain made the soil hard. I thought there would be more, because I finally remembered to add dirt as they were growing. At least you are growing potatoes. I didn't put any in this year. I miss them.